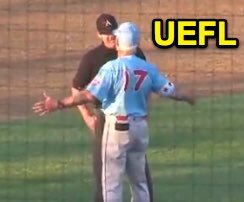 Not to be outdone, Chicago Dogs Manager Butch Hobson challenged Fargo-Moorhead RedHawks player Brennan "trash can" Metzger for the lack-of-sportsmanship award of the series in his ejection just a day later, care of 3B umpire Mike Jarboe during Tuesday's American Association action. The tantrums started Monday when Metzger, unhappy with a called third strike, took a garbage bin from the RedHawks dugout and placed it behind home plate in the umpire's usual position. Related Post: Featured Indy Ejection - Mike Jarboe (Brennan Metzger) (8/7/18). Tuesday, 3B Umpire Jarboe ejected Dogs Manager Hobson for arguing a safe call at third base. With two out and two on (R1, R2), RedHawks batter Yhoxian Medina hit a ground ball to Dogs third baseman Trey Vavra (you may remember him from a Blake Halligan ejection in the Australian Baseball League in 2016), who fielded the ball and raced to tag third base as RedHawks baserunner R2 Charlie Valerio slid into the bag, ruled safe by field umpire Jarboe, thus allowing the inning to continue (Fargo-Moorhead would eventually score Valerio from third base). At the time of the ejection, the Dogs were leading, 5-0. The Dogs ultimately won the contest, 12-7. Related Post: ABL Ejections - Blake Halligan, Andrew Bell (2 Vavras) (1/8/16). After leaving the dugout to argue the call, Hobson earned himself an ejection from a calm and collected Jarboe as the broadcaster predicted fireworks from Hobson on par with Monday's Metzger mess. Hobson then made a beeline for third base, picked up the base itself and handed it to a spectator before leaving the field. The Dogs and RedHawks conclude their series Wednesday night at 7pm at Newman Outdoor Field. Sidebar: On a related note, Metzger received a one-game suspension for Tuesday's ejection, having doubled down on what he said was a "garbage" decision Monday night, and found himself in a parody public service announcement about trash pickup.